This review for Men’s Rogaine Unscented Foam will help inform and advise customers on whether or not to purchase this product. 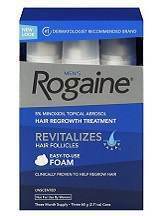 Rogaine foam is an FDA-approved hair regrowth foam for men. It is designed as an easy to use foam that treats hair loss by promoting hair regrowth in applied areas. It is available in most drug stores, as well as online from their official website. The active ingredient in Rogaine is 5% minoxidil, an FDA-approved ingredient that is clinically proven to promote hair growth. The Rogaine foam comes with a simple set of easy to follow instructions. The customer is to apply half a capful of foam onto their fingers. They are to apply the foam directly onto the area of the scalp where hair is thinning. The foam should then be massaged thoroughly throughout the hair loss area and allowed to dry. This process must be done twice daily, once in the morning and once at night. Results are expected after four months of continuous use. Rogaine can be purchased in one, two, four, six and twelve month supplies. According to their official website, a one month supply costs $29.99. A two month supply costs $49.99. A four month supply costs $59.99. A six month supply costs $84.99. A twelve month supply costs $159.99. Purchasing a four or six month supply also comes with instant membership to their online Real Results program, which automatically ships new supplies of Rogaine to customers directly, for less than 49 cents a day. After using this product twice daily for almost 2 months now, I have not noticed any significant improvements as of yet. I did notice I was shedding hair when I first started applying the foam, however, this is expected and is said to be a good sign. Results are said to be expected after four months of continuous use. I will keep using this product until the recommended four months and see if any improvements have been made. Customers should immediately stop the use of Rogaine and consult a doctor if any of these symptoms are observed: chest pain, rapid heartbeat, faintness, dizziness, sudden and unexplained weight gain, swelling of hands or feet, scalp irritation or redness, and unwanted facial hair growth. Use of product should also be stopped when hair regrowth is not seen after 4 months of continuous use. Rogaine offers a refunds or exchanges for unopened and unused products, along with the original box it was shipped in, within thirty days of purchase. The same policy applies to large orders of six or twelve month supplies; the entire supply must be unopened and unused. Shipping costs will, however, not be reimbursed unless there was a shipping error or product damage. Customer reviews are present in the products page. The reviews are either overwhelmingly positive or sit in the middle, mostly complaining about the high price of the product. The average of the reviews are positive. Rogaine seems to be a popular and effective product, according to a majority of its users. There are many positive reviews for Rogaine. It also comes with straight forward and easy-to-understand instructions. However, a major downside to Rogaine is its steep price that might steer people away from this product. It also comes with a money back guarantee that only applies to unused and unopened products. This money back policy seems lacking; customers who buy the six month supply and see no results by the fourth month cannot return their remaining two months’ worth of Rogaine. While some customers observed great results from using this product, the price is high enough to make others look for other cheaper alternatives.